ePublishing Knowledge BaseePublishing Knowledge BaseePublishing Knowledge Base User Profiles and Registration FormsWhat are the differences between the old Order History tab and the new Past Orders tab on readers' account profiles? Access the reader's profile by going to https://www.yourdomain.com/user/profile or clicking My Profile. 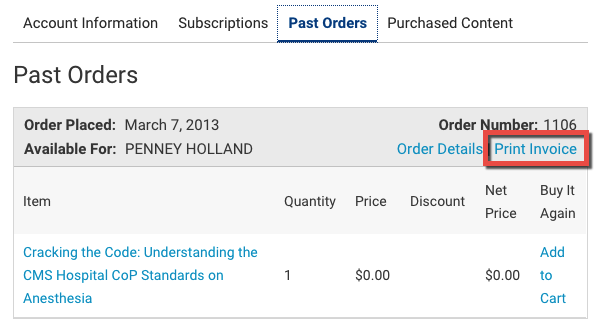 The reader will need to be logged into his account to see order confirmations, print invoices, access Buy It Again (if enabled), and view details for ordered items. The Order History tab has been replaced by the new Past Orders tab. Zoom: The Order History tab has been replaced by the new Past Orders tab. In the past, the Order History page was a simple table. Readers' options were limited. They could click the View link in the far-right column to see the details of the order and access the downloadable content, if applicable. The new Past Orders page presents a much more complete view of a reader's order history. 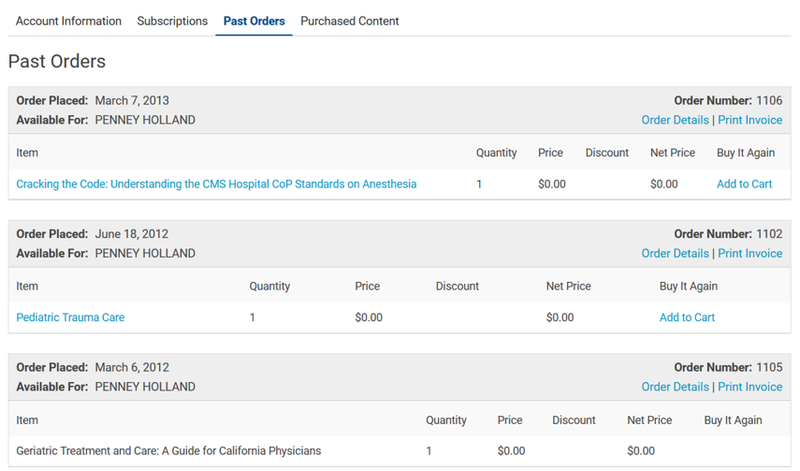 Readers can easily access an overview of their orders, click Order Details for specifics of an order, Print Invoice if they desire to print a record of the transaction, purchase an item again or renew a subscription if Buy It Again is enabled, and click the title to visit the product’s page on the website. Zoom: The new Past Orders page presents a much more complete view of a reader's order history. 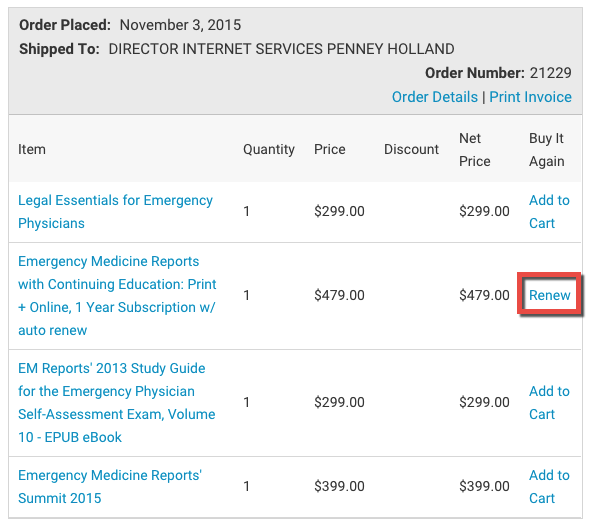 Readers can print an invoice, purchase an item again or renew their subscription (if enabled), as well as see all the items in their order without any additional clicks. Readers may wish to print an invoice for their records or need to print an invoice to be reimbursed by their company. Further information on printing invoices can be found in this article: How can a reader print an invoice for a past order? If this is enabled (click here for more information on the Buy It Again feature), the reader will have the option to purchase the item once more. If Buy It Again is enabled, and the item purchased was a subscription, the reader will have the option to renew the subscription directly from this page. The page now shows a more detailed overview of the order, rather than simple date, order number, and total that was previously presented. Readers can also click Order Details to see all of the information associated with the order placed. We've maintained the ability for a reader to review the contents of the email receipt that was sent to their inbox upon completion of their order. 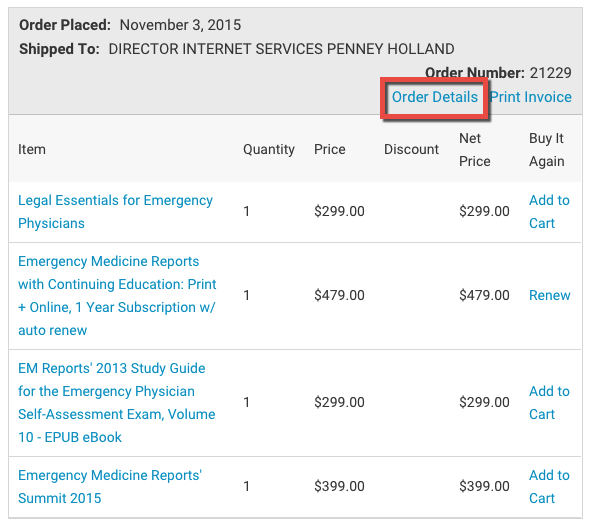 Prev: How do readers access the new Purchased Content page? 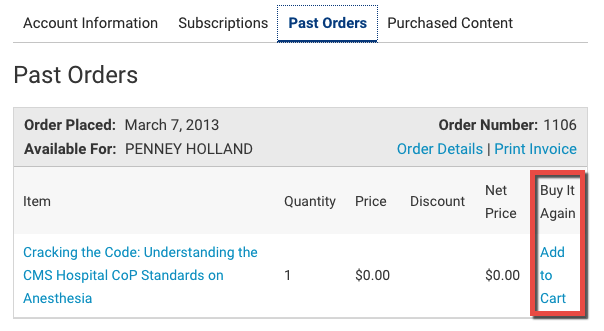 Next: How do I turn product thumbnail images on or off on a reader's Past Orders page?